In just a few weeks, I’ll be in Italy. The Tuscany area, to be exact. Florence, the capital of this beautiful district in central Italy, is where my husband and I will spend the first three nights of our trip. We’ve been to Florence before, for a one-day excursion on our first trip abroad in 2006. I remember it being magical—and overwhelming. So much to see in so little time. Michelangelo’s David is my most distinct memory. This is a statue that is so famous there are reproductions of it worth photographing, which is a good thing since we weren’t allowed to take pictures of the original in the Accademia Gallery. In Florence, we’ve booked a hotel room in a historical building that was once a former noble residence. Or so the hotel’s website says. We’re supposed to be in a lovely, quiet area just a few steps from the River Arno. Maybe this will be the view from our hotel window. In 2006, our guided tour stopped at the Ristorante Il Bargello for lunch. I wrote down what I ate and drank that day: lasagna (not the main course), flattened beef with gravy, spinach, potatoes, sparkling water, champagne, and Rosellino Toscano (wine). Lots of food and lots of wine. That’s what I remember about dining in Italy. One of the days my husband and I are based in Florence will be spent on an excursion to Pisa. On our last trip, we didn’t see what is probably one of the most famous sights in the country: the Leaning Tower of Pisa. Gotta get that wacky tourist photo of me holding up the tower! After Florence, we’ll join our friends for a week at a villa in the Tuscan countryside. 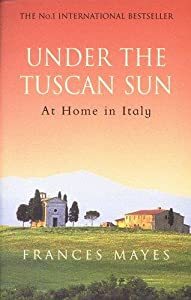 I’ve been reading Frances Mayes’ Under the Tuscan Sun and picture something rustic yet romantic. Something medieval yet picturesque. I’ll have to let you know how reality measures up to my imagination. Our group plans to take day trips to various Tuscan towns—maybe Siena, Bologna, Lucca, San Gimignano. We’ll drive (the guys, anyway, who’ve applied for international driving permits) through the beautiful countryside of Tuscany. I expect cypress trees, vineyards, hills, and valleys. Here’s a field of sunflowers I saw in June of 2006. I’m green with envy. I did a lot of research for my novel, Facing East, after visiting and loving Lucca and Pienza.on a garden tour. If I could live in Italy, I would pick Lucca. You will be there at a perfect time. Hope you will journal all the way to share with your favorite writing group! Excited for you! I’ve read Facing East. In fact, I have an autographed copy 😊. I’ll add Pienza to our list of possible places to visit. Hope to see you Thursday night at writers’ group.